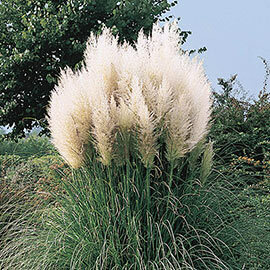 This glorious Pampas Grass variety erupts in long, silky blooms of white atop stately stems that reach 5-7 feet tall. A unique perennial, it is sure to draw admiring glances no matter where in the landscape you choose to plant them. The large, fluffy plumes appear in summer and stick around until the autumn. Creating an outstanding privacy screen, attention-grabbing focal point planting or glorious foundation variety, Pampas Grass is no ordinary ornamental. It is also a lovely way to camouflage areas of the landscape that are less than desirable. This summer-blooming perennial does best in a full-sun site. 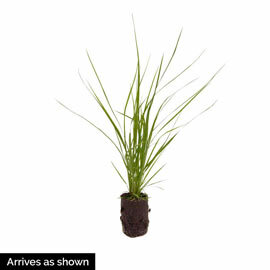 Foliage: Long, narrow saw-toothed grass. Blooms: Mid - late Summer. Flower Form: 1-1/2 to 2 foot panicles on 3 - 5 foot stems. Soil Requirements: Moist, but not wet; well-drained, loamy soil. Pruning: Prune to 12 inches in Spring as growth will start from ground again.